First things first, I’d like to apologise for the relative radio silence this week. There’s been an unfortunate confluence of events; injuries to both my hands combined with more insufferable heat and humidity make it very hard to do things like work with textiles or review tea. I’ve also been in a bit of a bad mood today, dealing with some tech issues. I decided it was time to slow down and focus on something that would improve my mental state and not exacerbate my hand injuries – time for ikebana! I knew going into it that I wanted to feature this awesome Tawami aluminium vase by AlArt that I received recently, and I wanted to keep the arrangement very minimal so as not to compete with it. 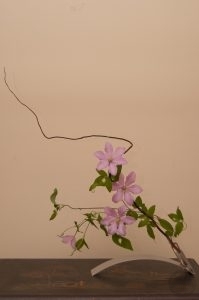 I knew our clematis was blooming, and then I remembered I still had some curly willow branches lying around that would work as an excellent structure to wrap them around. Clematis vines are very thin and fragile, and if I’d just put them in alone they would have flopped over and looked very sad indeed. 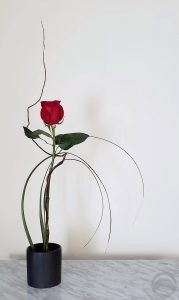 It feels very organic and balances out the sharp, modern lines of the vase perfectly. Putting this together was exactly what I needed. It made me stop and focus on something other than the issues that were frustrating me. For half an hour, all that mattered was the plant matter between my fingers. 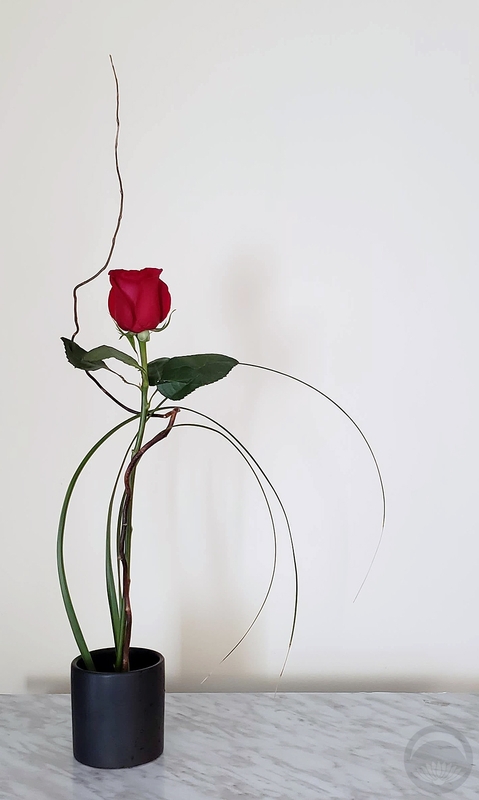 Ikebana can be a wonderful form of meditation, where you have to slow down and “listen” to what the flowers have to say, and how they want to interact with each other and the vessel you’ve chosen. If you find yourself going at top speed constantly and find that traditional “sit down and think of nothing” mindfulness techniques don’t work well for you, I urge you to give something like this a try! More beauties from our garden – this time it’s these stunning, vibrant poppy blossoms! 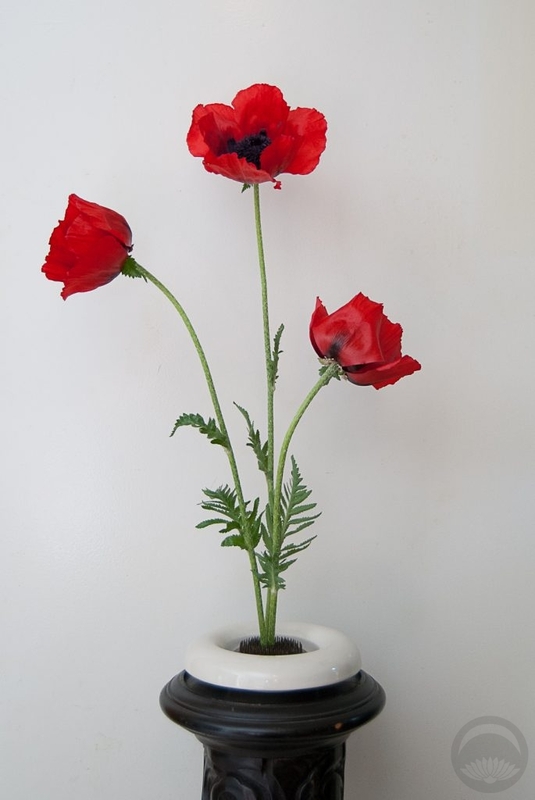 Poppies hold a special place in this household, for multiple reasons. My mother’s name is Poppy, and my parents met in the Canadian Armed Forces, so the poppy also represents remembrance. There are poppy-themed items all over our house, I have poppies incorporated into one of my tattoos, and of course my mother planted some in our front garden. 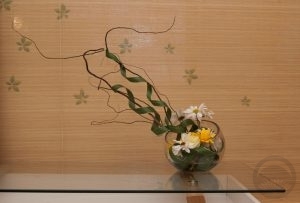 I really wanted this piece to be a very simple and clean arrangement with no clutter. 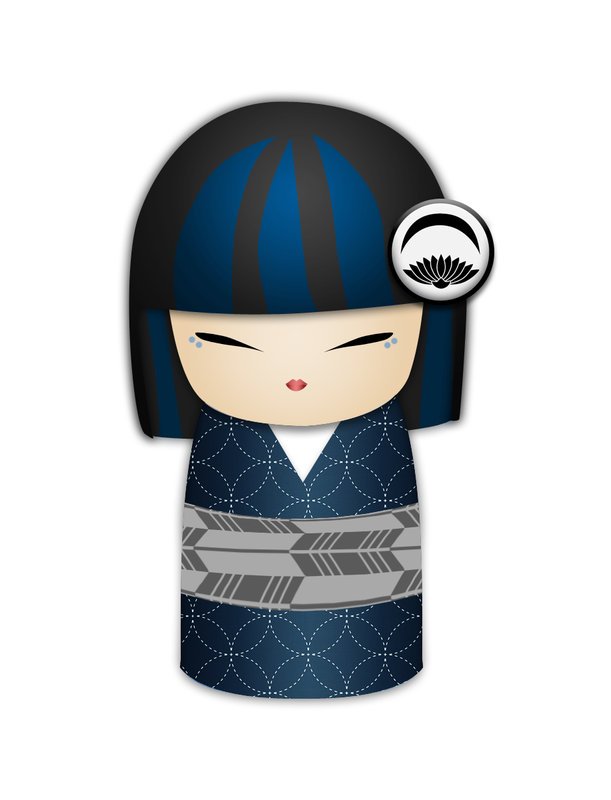 I went for a traditional format inspired by what I learned of the Sogetsu school style at the workshop I attended a few months back. A plain white vessel and black pedestal serve to anchor the whole thing while ensuring that all the focus remains on the blossoms themselves. And look, no screen today! Don’t worry though, it’ll definitely be back soon. Full confession – I actually made this arrangement back in November, using some more of my birthday bouquet, and then forgot to post it! It’s worked out well though, for multiple reasons. 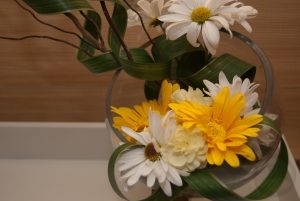 The weather here is cold and dreary and terrible, and seeing some bright sunny flowers is good for the soul. Also, I’ve been fighting off some really unpleasant ear infection/flu situation for nearly a month now and don’t have much energy to do anything right now, so finding these to share with you guys was a stroke of luck. I wanted to work on “off-balance balance”, countering the airy reach of the branches and greens with a more mounded, solid-feeling arrangement of flowers. I am quite happy with the chaotic profusion of the flowers, how you can’t completely tell where one ends and the next begins. It’s a contrast to the sparse and open arrangements I’ve been gravitating towards recently and getting out of my comfort zone is never a bad thing! I may be feeling miserable physically at the moment, but at least these pictures are bringing a little sunny happiness into my life. What first drew me to ikebana was the clean-lined simplicity of it all, the focus on a few sparse blooms without all the fluff and clutter that tends to be found in western-style flower deisgn. 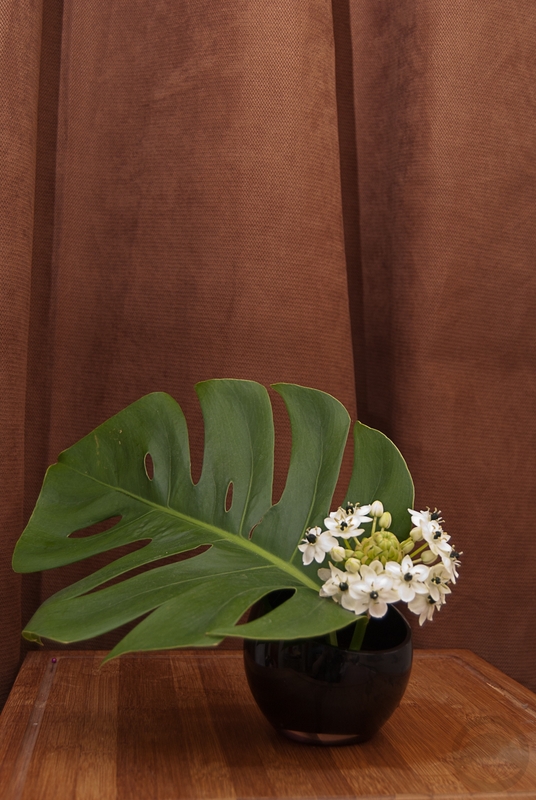 I’ve been experimenting a fair bit lately but I was itching to do a very sleek and low moribana-style arrangement, and when I found this gorgeous monstera leaf at the florist I knew it would be the perfect anchor for my next project. 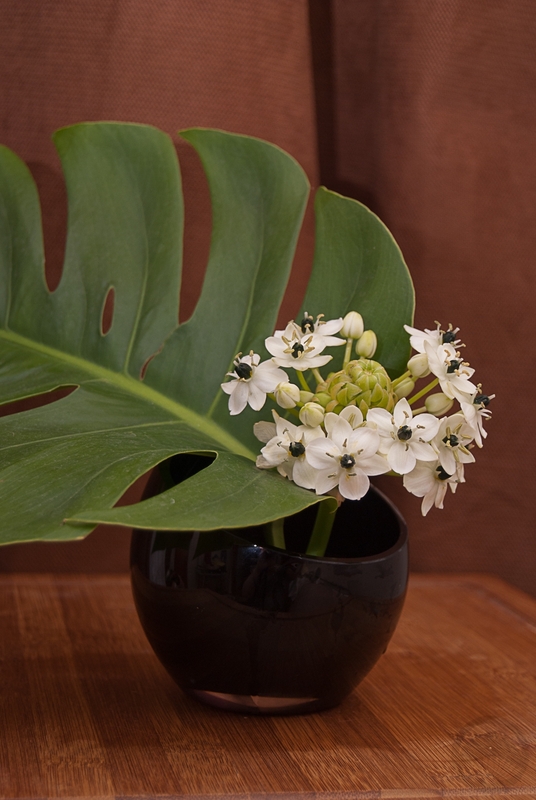 This interesting flower was all by its lonesome in a bucket in the flower fridge, and the texture and shape of it felt like a wonderful counterpoint to the glossy green foliage. I’m afraid I don’t remember what the flower is, but if anyone recognises it I’d love to know. The arrangement feels very heady and tropical to me, well-suited for to the oppressively muggy weather we’ve been having lately. I chose a very simple container to anchor them, in keeping with the clean and modernist vibe. I’m also quite pleased by how well the whole arrangement pops against the warm brown backdrop. This one might be incredibly simple, but it’s also incredibly effective.